Fuel was the first restaurant to offer a full menu under 500 calories. They have a delicious menu of panini, wraps, salads, rice power bowls, and more, all made fresh with 100% organic ingredients. They use only the best local ingredients, with many grown right in their own greenhouse in Philadelphia. Fuel also features a juice bar and coffee bar to quench all your thirst needs. It's time for Spring Training at Dilworth Park, presented by Rothman Institute! 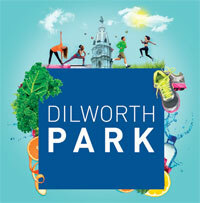 Through April 30, Dilworth Park is hosting a variety of sports and fitness programs, from bocce to Zumba to lectures, at locations throughout the park. Visit DilworthPark.org for the complete schedule. On March 19, Tavern on Broad will kick-off March Madness festivities with Bellevue Bracket, an NCAA basketball tournament "pep rally." The kick-off event will feature a special appearance by the Sixers Dancers, as well as food and drink specials, including a half-price happy hour for all drinks from 5-8pm. Plus, there will be sponsored giveaways and drink specials from Corona Light. On March 20, the monthly pop-up dining series Sip & Savor, held in the Café (next to the Lounge) continues. Each month, house sommeliers and mixologists team up with chef de cuisine Joe Liberatore to create original food and beverage pairing stations. For the March session, Philadelphia Distilling gets into the mix with cocktails, and Chef Liberatore will pair them with bar bites like oysters with caviar, deviled eggs, duck rillete and pork belly. $48 per person, not including tax and gratuity. Space is limited and reservations are recommended. Call 215.963.1500 or save a seat online at OpenTable.com. The Academy of Natural Sciences of Drexel University is offering pay-what-you-wish admission on March 23, to celebrate the founding of the nation’s oldest natural history museum. For history buffs, the official day the Academy was established by seven amateur naturalists was March 21, 1812. Initially meeting at one founder’s home, these men pulled together their specimen collections and other resources and created the Academy of Natural Sciences for “the encouragement and cultivation of the sciences and the advancement of useful learning.” Today the Academy is a leading natural history museum and the place to discover towering dinosaurs, experience a working fossil preparation lab, stroll among live butterflies, see live animal shows, participate in hands-on activities, see special exhibits, and much more. This spring, Koresh Dance Company brings a new contemporary work and a fashion-themed gala to the Suzanne Roberts Theatre. The company, recently hailed as “the most exciting dance experience in Philadelphia” (Philadelphia Weekly), will premiere Ronen Koresh’s latest work, Aftershock, March 26-27. On March 28, the performance will be coupled with Koresh Kouture: A Silent Auction + Gala, complete with wine tastings, a reception and fashion displays by Philadelphia designers. Through March 25, American pop artist John Stango will be featured in a pop-art pop-up gallery at 141 South 13th Street. Gallery hours are Wednesday, Thursday and Friday, 4-8pm; Saturday, noon-8pm; Sunday, noon-5 pm. Private Showings can be arranged by contacting David White 215.733.0190. Bradamant is a women-owned, Philadelphia-based company which makes luxurious bodysuits. On March 19, go to their pop-up shop at 1605 Walnut Street. Between 5-7pm the first 20 customers will receive a free gift card to Blo/Out. Refreshments will be served. On March 26, shop Bradamant and L'Occitane from 5-7pm to enter for a chance to win a Bradamant top and L'Occitane product! Refreshments will be served. The Prime Rib continues its second season of live jazz every Saturday night, starting at 10:15pm. March 21 features Barry Sames. Farid Barron will play on March 28. A full bar selection and late night menu are offered until midnight. No cover, no minimum.